Katie McInerney is a sports designer at the Tulsa World. MV: What inspired you to apply for the APSE Diversity Program? KM: I’ve known for a while — ever since I took my first editor position with my college newspaper — that I eventually wanted to become an editor or manager in a newsroom. I am a designer, and I knew that my path would be more difficult. I knew I needed to find ways to bolster my education to learn things I’d learn if I were out reporting and interacting with subjects. My sports editor knows that, and encouraged me to apply. I’m very glad I did. MV: When did you know that journalism was for you? KM: It was something I had an interest in when I was little — I used to play host, mimicking what I saw on SportsCenter. I took a more serious approach when I got into high school. When it came to finding a college that was right for me, I was really confident that I wanted to be in communications of some sort, and I ended up at Syracuse. When I look back, I realize my interest in writing and telling stories began when I was much younger. I just happened to choose design as my path to do that. I’m glad I ended up at a J-school with an independent student newspaper; I feel that my work at The Daily Orange helped affirm for me that I wanted to climb my way through the journalism ranks. Setting the agenda and searching for ways to tell interesting stories is something I had the opportunity to do in college and it’s what I want to do for the foreseeable future. MV: What’s the one story you’re most proud of and the one story you still wish to tell? KM: Being a designer and not a reporter, it’s a bit different for me. We recently wrapped up a year-long series on two high school football players trying to prove they deserved a shot at D-I football. The pair is statistically the best passing duo in Oklahoma high school history. And they are close friends. Our columnist and photographer spent so many hours in this tiny town an hour from Tulsa, speaking with family and friends and teachers and coaches. One part of the series was on their dedication to winning a state championship in honor of a teammate who died in a car crash a couple years ago, and it was absolutely heart-wrenching. The community really responded to the work, and my role as an editor and designer made me feel attached, too. There are lots of stories I still want to tell. I come from a very unique place — Nantucket, an island off the coast of Massachusetts — and there is a lot of history that I think needs to be told. My dad and brother are fishermen, and there’s a lot I don’t know about what they do that I want to know. MV: What challenges (if any) have you faced as a female sports journalist? KM: I spend a lot more time on my computer than others, so I’ve been lucky that I don’t have horror stories like so many other women in sports. But the experience at our diversity weekend in Indianapolis — when myself and two others, Graham Watson and Joey Chandler, were prevented from entering the Jaguars locker room during postgame interviews — was sort of surreal. The irony of it happening on a diversity weekend was not lost on me. I saw the way trolls attacked them. I’m not sure how I would have reacted. The sad part is I feel like it will happen to me eventually. It’s the strangest type of rite-of-passage. Let’s hope that’s something we can all change sooner rather than later. MV: How has social media helped (or hurt) your day-to-day job? KM: Social media has become a distraction more than anything. On some days, Twitter is a useful tool — I can see information quickly and anticipate how it might affect our stories or approach on what’s going in the paper. I love using it during games, both personally (so I can keep up if I’m not watching) and a fun engagement tool when I’m running the social media accounts for our team-specific sites. I still think social media has a lot of utility when it comes to finding interesting stories. And the interaction and engagement is something that every paper can improve upon. So I think it’s more of a help than it hurts us. That said — I try to err on the side of caution and just not tweet everything I want to tweet. I know I think my tweets are funnier than they actually are. So I overthink everything. The self-censorship has probably saved me from a headache more than once. KM: This question is too hard! Lane DeGregory’s features at the Tampa Bay Times are usually ones I read right away. Eli Saslow at the Washington Post is someone whose work I really admire — he is also an SU and Daily Orange alum, which makes it even better. His Pulitzer Prize-winning series, and his piece on the Oregon shooting victim — those stories just put you right in the moment and every time I finish them, I think about how he did it and am just amazed. I really like Mark Leibovich at the New York Times Magazine; his book “This Town” was fascinating. Is it too easy to say people like Tommy Tomlinson and Wright Thompson? I think the newspaper writer I read the most is the Boston Globe’s Nick Cafardo. My dad is a big baseball fan, so whatever Cafardo writes generally comes up in our weekly conversations. Lastly — Caity Weaver, who is now at GQ, is literally the funniest writer I’ve read. She did some hilarious stuff while at Gawker and I kind of got obsessed. MV: How would you improve diversity in journalism? KM: I think it starts at the source — where people are learning. I worked at my college paper for three years. In that time, there were maybe two females in the sports department. There might have been one person of color. Was that reflective of the university’s demographics? Maybe. Was that the fault of the students doing the hiring? I don’t think so; they chose from the pool they had. But it’s a lot easier to help people find opportunities to grow than it is to get universities to figure it out. The work that APSE (and AWSM, and SND, other groups I participate in) does on campuses is a start. Seeing people in the roles I want is something I really cling to. 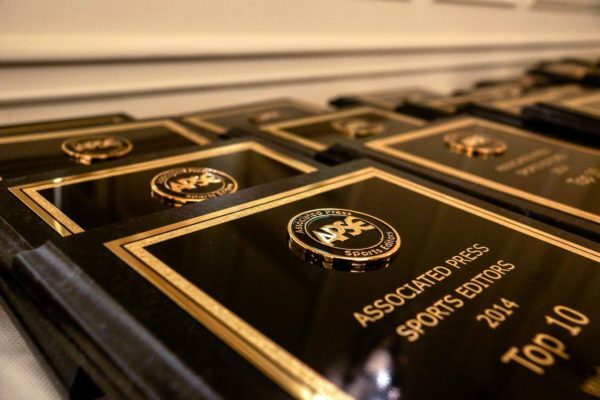 There are women in our sports department here — which can be an anomaly, based on what I read in the last APSE diversity report. Mentorship could be a great tool. It’s easier to continue on this path when you see others who have gone before you and have the opportunity to pick their brains.